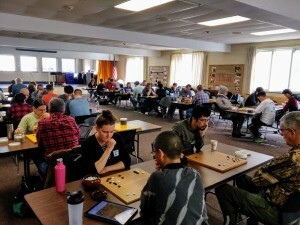 The Evanston Go Club’s November 10 fall tournament drew 42 players from five states; Illinois, Indiana, Michigan, Minnesota and, “Wait for it,” said TD Mark Rubenstein, “Hawaii!” The diverse field included players ranging in rank from 26k to 7d. 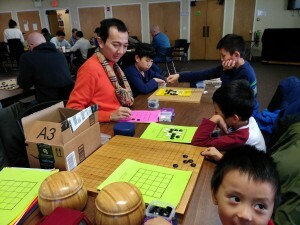 Albert Yen 7d, a regular at the Evanston tournaments for many years, was able to play his first-ever even game against another 7 dan, Boya (Eric) Hu. Daniel Lambert, who streams his games on Twitch, was recording his games at the tournament and has posted them online with commentary. And Xinming Simon Guo, the AGA’s 2015 Teacher of the Year, was there teaching some of his youngest students. 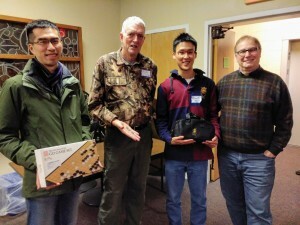 Prizes were supplied by Yellow Mountain Imports. “YMI has been donating prizes to us for many years; thanks Yellow Mountain!” said Rubenstein. As is the tradition, about a dozen players and family members went out for pizza after the tournament. Update (11/14): Links added for Daniel Lambert.